One of the biggest challenges faced by e-commerce marketers is providing customer service online that emulates the experience of shopping in bricks and mortar stores. E-commerce businesses don’t have the benefit of having a friendly sales assistant to help your customers with each step of their shopping journey. Or is there a way to surpass the in-store experience? 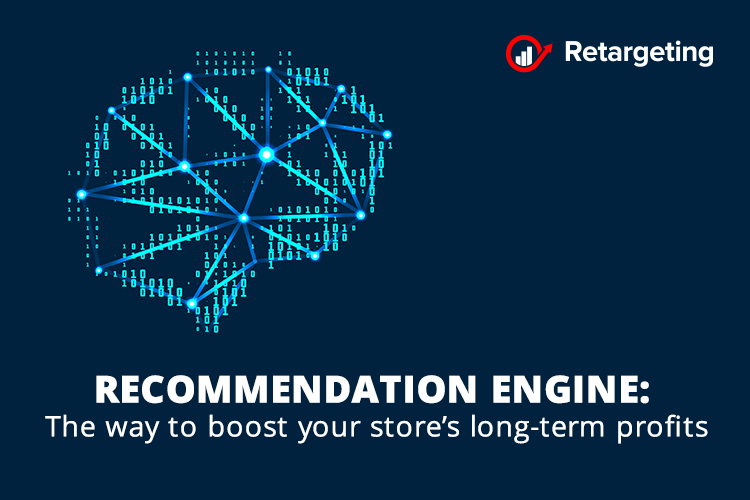 A recommendation engine provides the solution, offering your customers a shopping experience like they would receive if they were walking into a store. Helping shoppers find products that they want to buy is an essential part of turning them into customers. This is one area where a recommendation engine can have a significant impact on a person’s buying habits. Retargeting.biz made automation and personalization its core values so it came naturally to include among its features an artificial intelligence recommendation engine that makes connections user-to-products and user-to-user. In fact, the tool uses customers and site visitors’ data processed by an AI system to present more personalized product recommendations to them, based on their engagement with your products, past purchases, and other customers’ data. This way, identifying relevant products to recommend is a much faster process and much more accurate than relying on a human brain. It can also search the entire store catalog and select appealing products even from inventories containing thousands or even hundreds of thousands of items. As you gain more insights into your customers, based on what they engage with and what they purchase, you’re able to send them product recommendations that are more relevant to them. And that is an important tool to have, considering that about 74% of customers get frustrated when you send them promotional content that has nothing to do with their interests. Recommendation engines make use of your customer data to serve them only the most relevant content that is sure to increase engagement and conversions. Online stores do not always offer the same experience as that of an offline store. However, with the help of an artificial intelligence e-commerce tool, it is possible to achieve a similar or even better UX. A visual recommendation system can be used to serve customers with personalized online product recommendations that will result in more upselling, cross-selling thus boosting conversion rates. Online stores using this type of tool experience better conversion rates, more cross-selling, reduced cart abandonments and overall improvement in other KPIs like daily sales, CTR, social shares, bounce rates, time on site, etc. Speed, ease and relevance are crucial traits that the modern consumer demands. With so many options out there for where to shop online, shoppers lose patience if they don’t find what they want quickly on one store, as they know that there is an abundance of alternative stores available at their fingertips. Set a new standard for customer engagement and brand recognition. The ‘four Ps’ is a popular model often used for looking at the traditional marketing mix, covering product, price, promotion, and place. It works on the idea that effective marketing must focus on promoting the right products at the right price and in the right place. While advancements in the digital world have turned many marketing efforts on their head, a lot of the traditional principles still apply. And since Retargeting.biz has always relied on its partnership with the e-commerce platform around the world, it was a natural step for this partnership to go forward and include the recommendation engine. In fact, UNAS was one of the first platforms to make available this feature to its clients that use our marketing automation tool. To pull off personalized product recommendation engines well, requires data, such as the customer’s activity, engagement and purchase history. All the effort makes it worth it, since targeted content, rather than best sellers or new products, is much more relevant to your subscribers, and this will be reflected in your transaction rates. Grow your digital sales with future trends! Marketing myths you should stop believing! An emotion we bet you haven’t used to influence sales!